- Everton are most concrete and have shown the biggest interest, but nothing is decided yet. There are still some other big clubs from England, Spain and France who are interested and very soon I'll have to decide, said Noveski. 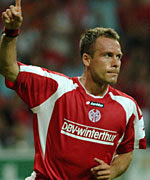 Nikolce Noveski is member of Mainz for 3 years and his contract is about to expire in June. According to transfermarkt.de he's worth 2.5M euros. If Noveski joins Everton, he will be the 4th Macedonian who played in the English Premier League after Goce Sedloski (Sheffield Wednesday), Gjorgi Hristov (Barnsley) and Artim Sakiri (WBA). Let me present you the Xtratime Community - the only place on the net where you can discuss about the football in Macedonia. Xtratime.org proved to be the best football forum on the internet and that's why with no doubts, the Macedonian Football forum on Xtratime.org became the official forum of MacedonianFootball.com Xtratime is the place for you to talk about football. Managed by its members, people from various parts of the globe gather at Xtratime to share their common passion for the game. Share your passion for football in the football forums! And as you get to know the community more, you'll find that Xtratime is not just about football. Xtratime.org is a flourishing diverse community and they want you to be part of it! Enjoy your stay here! The game is over, the Macedonian football fans are disappointed and the hopes of qualifying are shattered, many fans will question themselves do we really have what it takes to qualify for a major tournament. After the defeat in Croatia our chances for reaching the second place in this very tough and complicated group are slim, now we need a miracle to happen to qualify. But what do we do next? Do we wave the white flag and surrender or we stand still and fight to the end? Well I think the answer is simple. We have enough time until our next game against Israel at home to see what went wrong in the previous games and try to improve, we need to learn from our mistakes and make sure they don't happen again in the future. I completely understand the situation we are in the moment and agree that those qualification may well look over for us but we can't just simply give up now, we can't turn up for the next game just to make the numbers. The remaining games are as much important as the game against Croatia, they are not just for qualifying for the European Championship next summer, those remaining games are so much important for the Fifa World ranking. We need to win as much points as possible in the next games if we want to improve on our current position because that is going to be very crucial for the draw of the groups for the next World Cup. Now in this difficult moment for the players as well we need to give them our vote of confidence and to give them all our support because on the end of the day they didn't let us down, they didn't ashamed our country, they give their best and they made us proud to be a Macedonians and I believe that with a little bit of luck in the next draw we can qualify for the next World Cup, but until then we don't need to let our emotions to take over and start blaming each other for this bad result, because we lost the game from a quality side which is full of recognized world class football players and as we all know only one can be the winner, in this unfortunate moment for us they are the winners but let's hope so the very next time we will put it wright. It took ten minutes before the game's first goal attempt, a Milan Rapaic effort for Croatia that sailed harmlessly over. Macedonia then signaled their intent as Goran Maznov's floated corner found its way to Ilco Naumoski in the six-metre box, but he failed to connect cleanly, allowing a thankful Josip Simunic to clear. Rapaic was wayward from distance again, yet he almost turned provider, finding Marko Babic in the area, who headed over. 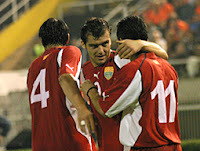 On 38 minutes, the Macedonians shocked the home crowd by breaking the deadlock. Dario Simic fouled Naumoski and from the resulting free-kick, Sedloski thumped the ball low past Croatia keeper Stipe Pletikosa from 25 metres. The goal knocked Croatia out of their stride as the half wound down. Rapaić was subsequently replaced by Srna at half-time and he hauled the hosts level on 58 minutes, smashing a free-kick high into the centre of the goal. Sedloski was then harshly dismissed with a second yellow card with little over 20 minutes left. Although Croatia dominated, Macedonia was dangerous and threatened on the counter. The Croats tried to penetrate the stubborn defense through influential midfielder Luka Modric, who had many strong runs and deft passes. Marko Babic and Bosko Balaban also had close chances for Croatia, while Goran Pandev threatened for the visitors. Croatia smelt victory and they breached a retreating defence two minutes from time when Srna crossed for Eduardo to convert from close range. Croatia: Stipe Pletikosa; Dario Simic, Josip Simunic, Vedran Corluka, Niko Kovac, Marko Babic, Niko Kranjcar, Milan Rapaic (Dario Srna, 46), Luka Modric, Bosko Balaban (Igor Budan, 80), Eduardo da Silva. Macedonia: Jane Nikoloski; Nikolce Noveski, Goce Sedloski, Aleksandar Mitreski (Igor Jancevski, 77), Aleksandar Vasoskis, Vlade Lazerevski, Velice Sumolikoski, Ilco Naumoski (Darko Tasevski, 60), Robert Popov, Goran Pandev, Goran Maznov (Miroslav Vajs, 72). Croatia leads Group E with 13 points, two ahead of Russia and five ahead of England, Israel and Macedonia. This is probably the most important match for Macedonia in the qualifiers so far. Coming back from Croatia without points will definitely erase all wishes and chances about qualifying for the EURO 2008. That's why all members of the Macedonian national team are extra motivated for this match. But it will not be easy. We all know that. It will not be easy to play against Croatia - former bronze team, currently ranked 12th in the World, full with great players... and definitely one of the biggest factor of their success on home ground is playing on Maksimir - the Croatian impregnable fortress. Croatia has never lost an official match on that stadium. The only lost match was the 0:2 friendly match with France in 2000. On the other 34 matches played on Maksimir, Croatia have 24 wins and 10 draws with fantastic 80 goals scored and only 20 conceded. As you can see Macedonia is not defeated on the last 7 matches played away from home and has conceded only 1 goal. Macedonia are always playing extra motivated against the big teams and are always in the mood for making surprises and spoiling the plans. The Macedonian national team is always making at least 2 surprising results on the matches with bigger teams. Is this match away to Croatia going to be the 2nd surprise for Macedonia in this qualifiers after the 0:0 away to England? We should all expect great match on the Maksimir stadium in Zagreb because of the hot atmosphere between the player and the fans on both sides. Let me raise the warm the atmosphere a little more with the photo of Karolina Goceva, Macedonia's best (and the hottest) female singer, who visited and gave support to our boys on their trainings in Ohrid. 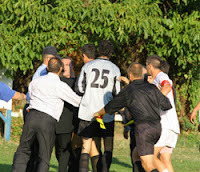 No First league football in Macedonia this weekend because of the heavy incident from the previous round when Vardar's players were attacked on the half time break in Kumanovo. All 6 First league matches are postponed until the final decision is made for the abandoned match between Bashkimi and Vardar. Previously the Football Federation of Macedonia canceled the matches from the 22nd round involving Bashkimi and Vardar but because of the regularity, today they decided to cancel all matches from the Macedonian First League. The date for the matches of the 22nd round will be decided after solving the case with the Bashkimi-Vardar match. This is the last thing that the Macedonian football needs. And that's why the Macedonian football fans are asking: "Until when are we going to watch scenes like this on the football stadiums in Macedonia"? The football in Macedonia is going down and down. But until when? Let's all hope that all this will finish tomorrow in when the current leaders of the FFM will not get the support from the delegates on the congress in Struga. After the 0:1 win away to Albania on the friendly match played last month, Macedonia got a 4 place jump on the new FIFA ranking list. The four position progression took Macedonia on the 49th place with 585 points and that's the biggest success in the history of the Macedonian national team. Argentina took the first place on the list, passing Italy and Brazil. Croatia is the best ranked team from our Group E in the qualifying for the EURO 2008. They stayed on the 12th position. Russia had 4 place progression and is now on the 23rd position. Israel is also better ranked than Macedonia and is now on the 38th position. Estonia is still 106th and worst placed team from our group is Andorra on the 163rd position. The biggest potential football star and current Inter Milan player, 17 year old Goran Slavkovski, today arrived in Macedonia after agreeing to wear the red and yellow jersey of the Macedonian national team. Slavkovski is born in Sweden but with Macedonian origins and that's why there was a huge "battle" for him by both Football Federations. - I'm very happy that I'm in Macedonia and that I will play for the Macedonian national team. I don't speak much in front of the cameras because I'm expressing myself on the pitch. Goran Slavkovski will have the debut in his red and yellow No.9 jersey for Macedonia on the friendly match between the U21 national teams of Macedonia and Albania that will be played on 25th March on the Gradski stadium in Skopje. Great news for all who like to bet. Expekt, one of the best online bookmakers recently have included the Macedonian league in their offer. - Consistently competitive "Odds & Offers"
So what are you waiting for? Take your credit card and open an account by pressing HERE, or on the banner.